Drum Corps International wishes the United States Marine Corps a happy anniversary on the occasion of the celebration of its 235th year. For many years, "The Commandant's Own," The USMC Drum & Bugle Corps has been a strategic partner of Drum Corps International and a perennial featured performer at the DCI World Championships. 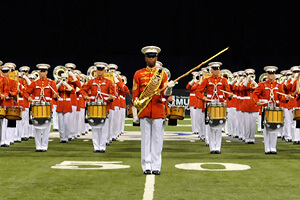 We look forward to the corps returning for DCI's 40th World Championship in 2011. Until then, we send out a big, hearty "Semper Fi" to Major Brian Dix, director of the corps, and all our friends in the United States Marine Corps as we wish them the best for their next 235 years. View a photo gallery of The Commandant's Own at the 2010 World Championships.